What’s So Good About GoodBelly? Boulder based GoodBelly was founded from the original maker of White Wave Silk soy milk, Steve Demos. Since leaving White Wave in 2005, Demos developed GoodBelly probiotics under parent company NextFoods, Inc. Demos noted there was a probiotic drink in Europe that became a food staple in Sweden. This drink came about from research 18 years ago from a group of gastroenterologists who noticed a difference in the intestines of healthy people compared to unhealthy people for surgery. A biopsy sample from the healthy intestines revealed the bacteria lactobacilus plantarum 299v was present in their intestines. Seventeen clinical trials with humans have been done on this strain and have shown further benefits for Irritable Bowel Syndrome and antibiotic resistant diarrhea with NO contraindications for immune compromised people like those with AIDS, the elderly or very young. Three things are required for a probiotic. 2. They have to colonize in the intestine. Cells in your intestine are constantly turning over. Therefore, the colonization of probiotics has to continuously be ingested in order for the benefits to persist which can be anywhere from every day to up to once every five days. 3. Has to be beneficial to the host. What About Yogurt and Supplements? GoodBelly happens to be the only food product in the US with the particular strain of lactobacilus plantarum 299v probiotic that has research from 18 preclinical trials and 16 randomized controlled trials. Yogurt is required by the FDA to have 2 strains of live and active cultures. Many think this is the same as a probiotic, but it is not. Some products do have probiotics like Activia and Ya-Kult. 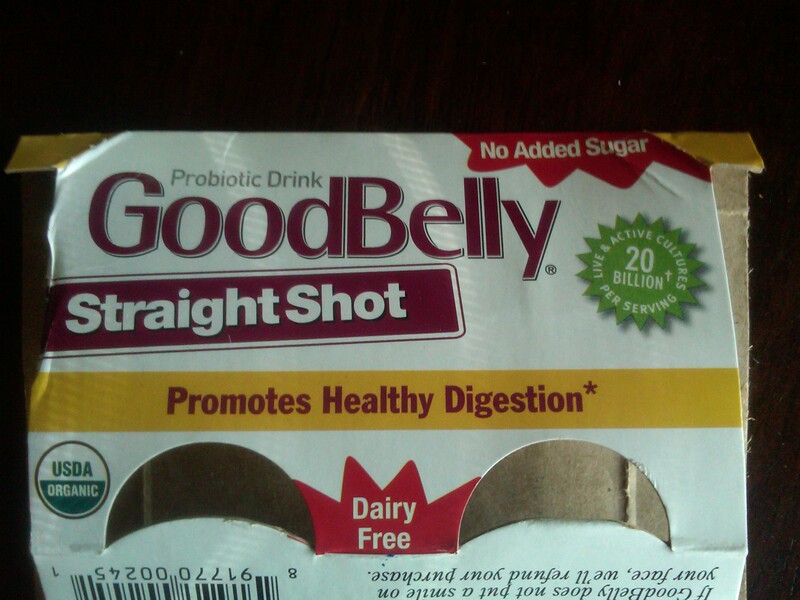 GoodBelly is a non-dairy, vegan, soy free way to get probiotics. GoodBelly provides lp 299v of at least 10 billion units per serving which has been shown in research to provide beneficial health effects. The number of needed probiotics is strain specific; multi-strain supplements may compete for colonization in your intestine. According to GoodBelly, there are no randomized controlled trials for multiple strains in one supplement. We live in a world where there are fewer harmful and beneficial bacteria around. Things like fermentation, gardening and playing in the dirt provided beneficial bacteria in the past. With the increase of antibiotics and pasteurization, microflora like probiotics have decreased from natural food products. Also, with an increase of C-section births, there is an increase of babies born without passing through the birth canal to get beneficial bacteria from the mother. The gastrointestinal tract provides 70% of the body’s immune defense. Beneficial bacteria in your intestines can help your immune system stay strong. My favorite flavor: Straight shot drink only has 3 gm of sugar and tastes great. GoodBelly offers a satisfaction guaranteed 12 day challenge. You can get coupons for GoodBelly for 12 days to see how it makes you feel. Simply try GoodBelly every day for 12 days. I decided to try this challenge with the enticement of coupons for free product. Why not if it’s free? GoodBelly comes in little shots or you can buy a carton of various juice flavors. I liked the shots because they were already portioned out and lower in sugar content. Specifically, the straight shots are very low in sugar and my preferred choice. GoodBelly found that 83% of people felt an effect between 8-12 days taking the product. This amount of time ensures the good bacteria replace the bad bacteria in your gut. You may not feel a major difference, as I didn’t. However, research has shown this probiotic can’t hurt and can only help! If you have some gastrointestinal issues, probiotics may help with these issues. However, GoodBelly is the first to claim on their product they are not claiming this product will cure anything. Try it out for yourself and see if you can tell a difference from probiotics. Next Next post: Don’t Dis The Doughnut!